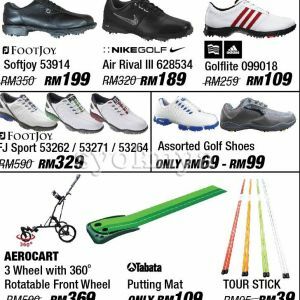 MST Golf Equipment Shoes Accessories Warehouse Sale Clearance. 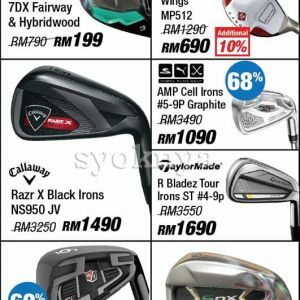 Enjoy discounts up to 70% on golf equipment, golf accessories, golf balls, golf bags, golf wears, golf shoes and many more. Participating brands are Nike Golf, TaylorMade, Yamaha, Callaway, Williams Sports, Akira, Odyssey, Wilson Staff, Antigua, Cutter & Buck, Bell & Page, PGA Tour, Footjoy and many more. Call at +603 2166 3400 or +603 2164 4358 for more enquiries. 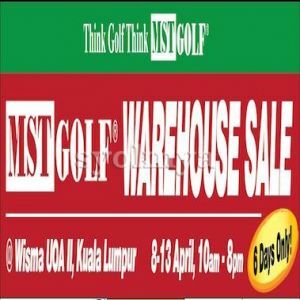 MST GOLF is the largest golf retail chain in the country with more than 30 retail outlets. Its undisputed leadership in golf retail is evident in the extensive network of mega-sized golf Superstores, golf counters in JUSCO and Parkson departmental stores, and pro shops in premium golf and country clubs. 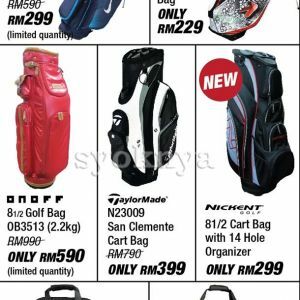 In addition to carrying full range of golfing equipments, accessories and apparels, MST GOLF outlets offer a shopping experience unparallel to others. The outlets exude a very relaxed friendly environment where golfers will feel at ease browsing around. 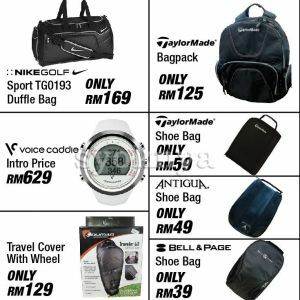 MST GOLF is every golfer’s preferred golf retailer and the ultimate golf shopping destination. Venue : M7-8, Mezzanine Floor, Wisma UOA II, No 21, Jalan Pinang, 50450 Kuala Lumpur, Malaysia. 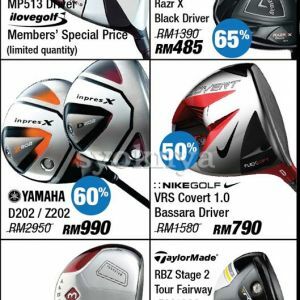 Kindly visit to MST Golf Malaysia facebook & website at https://www.facebook.com/MSTGOLF & http://www.mstgolf.com/ for more details. TIP: Have difficulty to the location? Let us guide you to the destination by using your Smartphone GPS Navigation Apps (Waze, Apple Maps & Google Maps). 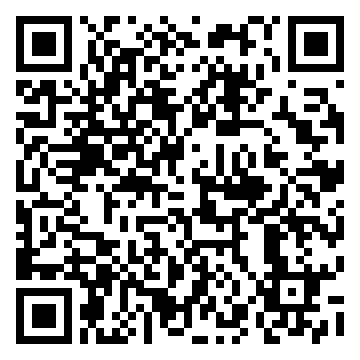 - Use Smartphone browser (Safari / Chrome) or scan the ad QR Code browse to this advertisement. - Tap on the "How to get there". - Tap on preferred app to direct you to the location. Lets 'Share' this advertisement to your FB friends if find this good and don't forget to 'Like' Syoknya Malaysia page for your support, thanks! Location Map Get directions easily by clicking on any of the icons to Launch Waze, Apple Map or Google Map on your smartphones.